The Solar Heat Harvester System is controlled and monitored by a specifically developed controller that makes it the best choice for harvesting attic or conservatory heat. If your home is fitted with a conventional heating system, and you want the Solar Heat Harvester System to operate, the Attic Heat Harvester controller 'maximum room temperature' in the Parameter Setting Mode of the Attic Heat Harvester Controller Manual must be set to a temperature that is a little higher than the thermostat on your current heating system. If you dont do this your home temperature will be too high for the Attic Heat Harvester system to operate. 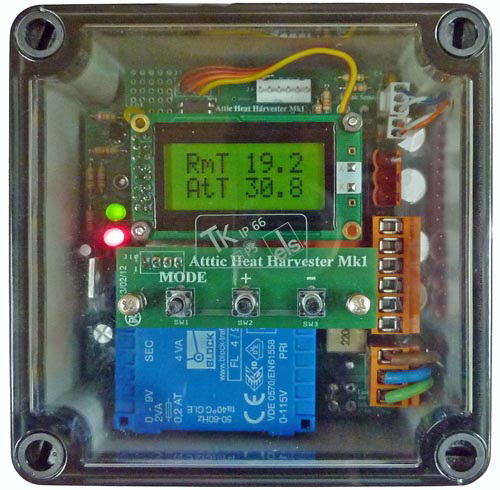 The Attic Heat Harvester Controller has a 2 line back lit LCD display and 3 key buttons: 'Mode', '+', '-'. The 'Mode' key, together with other keys selects: Display, System Performance, Parameter Setting, Test, Performance History Reset, and Fan On modes. The '+' and '-' keys are used together with the Mode key to select the display mode, in Parameter Setting mode to change pre-set parameters, and to select system test modes. When any key is pressed the display back light is turned on for 60 seconds. 6) A short '+' key press in Room and Attic/Conservatory temperature display mode displays system output status for one second in every eight for a minute. When operating normally the LCD displays the Room Temperature (RmT) and the Attic Temperature (AtT) or Conservatory Temperature (CsT) in °C or °F units as selected by the Units setup parameter. If the current time has been set (this can be done during the power up sequence or by using Parameter Setup) the current time is displayed for 1 second in every 8. If the '+' key is pressed for a short period the current system output status is displayed for 1 second in every 8 for 60 seconds. The 4 outputs (OP's) are: Heat Fan, Main Air Valve (MAV),Cool Fan, and Valve Power (VPwr). The Attic Heat harvester Controller calculates and stores system performance data, this mode is selected by pressing the 'Mode' Key and releasing it within 1 second. j) The display then reverts to operating normally displaying Room and Attic/Conservatory temperatures. If the '+' is operated during the display of performance data the next data will be displayed. If the '-' is operated during the display of performance data the next data display will be delayed by 6 seconds. If, during the display sequence, the 'Mode' key is pressed for 1 second the display reverts to normal mode displaying temperatures. At power on the controller gives the option of setting the clock parameters detailed in section 3j, 3k and 3l below. Before the clock time can be displayed the current time minutes must be set either at power on or in Parameter Setting Mode. If the current clock time is not set, or the weekday or weekend heat on times are at 00:00, the harvesting system operates on all the days when attic/conservatory, room temperatures and user pre-set parameters permit. System performance data is stored at power down and restored at the next power up. Parameter Setting mode is entered by pressing and holding the 'Mode' key for 2 seconds or more, then releasing it. You can set the following parameters to meet your needs to for example 'maximise system power generated' or 'maximise system, efficiency'. You may wish to adjust the controller settings to suit the current season at your location. Note: The controller can increase and decrease this temperature to the minimum preset value according to recent maximum attic/conservatory temperatures. l) The display then reverts to operating normally displaying Room and Attic/Conservatory temperatures. If during a) thru k) above either the '+' or '–' key is pressed the parameter displayed or highlighted, is increased, or decreased, to it's permitted maximum or minimum value. The display sequence resumes 4 seconds after the last key was pressed. If during h) above either the '+' or '-' key is quickly pressed, system units are toggled. If, during the display sequence the ‘Mode’ key is pressed and released the display reverts to normal display mode. Day, hours and minutes are set sequentially, the LCD display cursor s shows the active units. Whenever Current Time minutes are changed current time seconds are set to 00. Before weekday and weekend clock times are displayed the current time minutes must be set. When the system is set to operate in 'Metric' units temperatures are displayed in degrees Centigrade and fan flow is displayed in cu mtrs/Hr. When the system is set to operate in ‘English’ units temperatures are displayed in degrees Fahrenheit and fan flow is displayed in cu ft/min. Current AHH Controller set-up parameters, except for times, are stored at power down and restored at the next power up. System Test mode is selected by pressing both the 'Mode' and '-' Keys together and releasing them within 1 second. System Test mode tests the main Attic Heat Harvester Controller system elements. If no keys are pressed the following System Tests are executed sequentially at 6 second intervals. 'Display Test' tests the LCD display. 'Key Pad Test' permits each key to be tested. During this test if a key is pressed it is displayed. d) 'System 12 and 5 volt supply Test' displays the voltage levels of the 12 volt and 5 volt supplies. The 5 volt level should be from 4.75 to 5.25 volts. The 12 volt supply level should be between 11.5 and 17 volts. e) System Early Power Down (EPD) voltage test displays the Early Power Down (EPD) voltage input, this should be between 2.0 and 3.2 volts. f) System Outputs Test sequentially operates the Heating Fan (Heat Fan), Main Air Valve (AirValve), Cooling Fan (Cool Fan) , Valve Power, (ValvePwr) outputs at 1 second intervals, 3 times. g) Time shows the current time in hours minutes and seconds. h) Normal display Mode is then resumed. c) If the ‘Mode’ key is pressed then released, System Test mode is ended, normal display mode is then resumed. 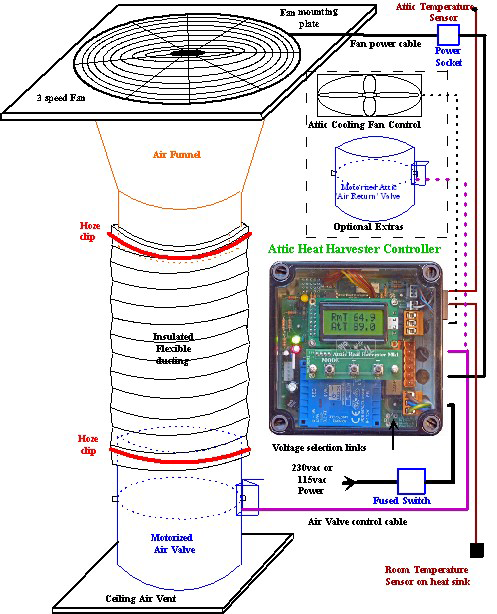 If the system memory capacity is not exceeded the Attic Heat Harvester Controller calculates and stores Total Power, Total Efficiency, Harvesting costs, Fan running Hours and average Attic – Room or Conservatory – Room Temperatures, Un-used Heat, Cooling costs, Cooling Fan running hours, and Maximum and Minimum Attic Temperatures. Performance data is stored in non-volatile memory when power is removed from the system. b) Within 4 seconds press and hold both the 'Mode' and '–' keys together and then release them. If b) above is not completed within the time allowed 'Aborted!' is displayed, performance data memory is unchanged and normal display mode is resumed. Fan ON mode is selected by pressing both the 'Mode' and '+' keys for a short period then releasing them. Fan on mode opens the air valve then after a short delay turns on both the main and, if fitted, the Attic Cooling Fan, in this mode the display shows Room and either Attic or Conservatory Temperatures. On mode is ended by pressing the ‘Mode’ key, the fan is turned off and air valve is closed. a) Display Connection Test – This checks that there are no display connection short circuits. If a short circuit is detected the 'yellow Running LED' is flashed rapidly. b) Key Test – This checks that no key is depressed, if a key appears to be pressed 'KeyError' is continually displayed together with the key seen. c) System Power test – This test system power levels, errors are displayed. If no problems are detected the Attic Heat Harvesting controller Displays the system sign On and version messages. d) Displays 'Set Clock' and 'Mon:00:00' permitting the user to optionally set the current day, hour and minute indicated by a flashing cursor. When the minute is set seconds are set to 00. ('Hr:Min:Sec' can be displayed in System Test Mode). If no keys are pressed the next stage begins in 18 seconds. e) Displays the weekday heat on time permitting the user to optionally set the hour and minute that the Attic Heat Harvester heating system is activated each weekday. If no keys are pressed the next stage begins in 18 seconds. If no time is set the system is active on every weekday. f) Displays the weekend heat on time permitting the user to optionally set the hour and minute that the attic or conservatory heat harvesting system is activated on Saturday and Sunday. If no keys are pressed the next stage begins in 18 seconds. If no time is set the system is active on every Saturday and Sunday. g) The Attic Solar Space Heating System controller begins normal operation displaying room and attic temperatures. a) the correct operation of the room and attic temperature sensors – errors will be displayed. If either of these errors are detected check and repair or replace the temperature sensor cables. b) the maximum system Current Power level is 65,535 watts which is obtained by multiplying a constant by the current attic – room temperature difference and the fan air flow parameter. If the product exceeds 65,535 'PwrLimit Exceeded' is displayed, indicating that future Total Power data is understated. Should this error message be displayed check the Fan Flow parameter setting. c) the maximum system efficiency is 999.9, if either the current or total efficiency calculated exceeds 999.9 either 'CEff 2Hi' or 'TEff 2Hi' will be displayed. d) the system 12 volt supply, should this drop below 9 volts the Attic Heat Harvester Controller will think it is being turned off and will save its current settings and system performance data in non-volatile memory then display the AC Volts Too Low message until the power dies. When the unit is next turned on the system settings and performance data are reloaded. If any Performance Data Value is within 88% of it's maximum design value the Attic Heat Harvester Controller will continue to work normally and the LCD backlight will flash continually and a warning message will be displayed. This gives the user the option of reading and recording the system's performance data then resetting Performance Data Memory. Typically it will take more than a year for performance data to reach near maximum capacity values. If any Performance Data Value is within 99% of it's maximum design value the Attic Heat Harvester Controller will turn the fan off and stop recording further Performance Data. A relevant warning message is then continually displayed and the display back-light is turned ON and OFF. In this mode the keys and system menus still operate. The Systems Performance memory must then be cleared to restore normal operation.